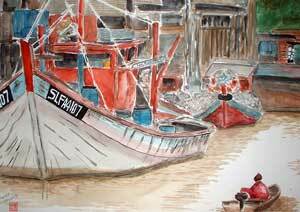 This is the painting which sparked my interest with fishing boats. This is one of the deep-sea fishing trawlers that fishermen in Kuala Selangor use (note the SLFA prefix for Selangor fishing boats). I painted this at an art class way back in Sept 2003. I was also trying to capture the colour of the muddy water at low tide. The chap on the right is heading upriver, perhaps to his boat as the tide is coming in. How do you paint such a confusing painting? Well, like my mentor said it, start by composing areas of similar colour, like a giant jigsaw puzzle, and you will be able to put up a colourful painting - no matter how confusing it looks.